We were studying the assassination of Archduke Franz Ferdinand when we saw the plume of dust. Gregori spotted it first—in truth he spent a lot of time watching for it—and stood up so fast that his chair tipped over. It crashed to the flagstones of the orderly little classroom, loud as rifle fire. Long and careful training kept the rest of us from moving. Grego alone stood as if his muscles had all seized, with seven pairs of human eyes and a dozen kinds of sensors locked on him. He was looking out the window. So, naturally, I looked out the window. It took me a moment to spot the mark on the horizon: a bit of dust, as might be kicked up by a small surface vehicle, or a rider on horseback. It looked as if someone had tried to erase a pencil mark from the sky. Terror came to me the way it does in dreams—all encompassing, all at once. The air froze in my lungs. I felt my teeth click together. But then, as I began to twist toward the window, I stopped. No, I would not make a spectacle of myself. I was Greta Gustafsen Stuart, Duchess of Halifax and Crown Princess of the Pan Polar Confederacy. I was a seventh-generation hostage, and the future ruler of a superpower. Even if I was about to die—and the dust meant I probably was—even if I was about to die, I would not freeze and tremble. I would not gawp. So. I put my hands one on top of the other and pushed them flat. I breathed in through my nose and blew out through my mouth as if blowing out a candle, which is a good way to cope with any kind of distress or pain. In short, I pulled myself back into being royalty. All around me I could sense everyone else doing the same. Only Grego was left standing, as if caught in a spotlight. That was clearly out of bounds—he’d be punished in a moment—but in my heart I did not blame him. Someone was coming here. And no one came here, except to kill one of us. “I— No.” Grego broke himself from the window. His hair was the color of a cirrus cloud, and the sun caught the wiry sweep of it. The implanted cybernetic irises made his eyes look alien. “World War One,” he said, his accent sharpening the Ws almost to Vs. He looked down at his upturned chair as if he didn’t know what it was for. Da-Xia glided to her feet. She bowed to Grego, and then righted his chair. Grego sat down and pushed at his face with both hands. “Are you all right?” asked Da-Xia, pushing—as she ever did—the edge of what we were allowed. “Of course. Žinoma, yes, of course.” Grego’s eyes flicked past her to look at the dust. “It is only the usual impending doom.” Grego is the son of one of the grand dukes of the Baltic Alliance, and his country, like mine, was on the brink of war. But mine was closer to that brink than his. On her way back to her seat, Da-Xia laid her hand on top of my arm. It rested lightly, momentarily, like a hummingbird on a branch. The rider wasn’t coming for Xie—her nation was nowhere close to a war—so her touch was pure gift. And then it was gone. “Imagine,” I echoed. My lips felt numb and stiff. I did not look at the dust. No one did. Beside me I could hear Sidney’s breath shudder. I could almost feel it, as if our bodies were pressed together. The seven of us had been together for so long that in times of great stress we could have whole conversations that were assembled from everyone’s most typical reactions. This was one of them. Sidney (his voice cracking a little) said that it could be penguins versus polar bears and Thandi would still call it Eurocentric. Thandi answered sharply, while Han, who is bad with irony, noted that penguins and polar bears did not live on the same continent, and therefore had no recorded wars. In this prefabricated way, we discussed history like good students—and kept our seats like good hostages. Grego stayed silent, his white hand knotted in his whiter hair. Little Han watched Grego as if puzzled. Da-Xia tucked her feet up under herself in a posture of formal serenity. Atta, who has not spoken aloud in two years, was alone in looking overtly out the window. His eyes were like the eyes of a dead dog. Talk in the classroom was drying up. Trickling away. There was a tiny noise at the desk beside mine: Sidney, tapping his fingertips on his notebook. He lifted them a millimeter, dropped them, lifted and dropped. There were pinpricks of sweat on his cheekbones and lips. I pulled my eyes from him, and saw that the dust was much closer. At the base of the plume was the bump-bumping dot of a rider on horseback. I could see the rider’s wings. It was certain, then. The rider was a Swan Rider. The Swan Riders are humans in the employ of the United Nations. They are sent out to present official declarations of war—to present the declarations, and to kill the official hostages. And we knew which of our nations was likely to be at war. The Swan Rider was coming to kill Sidney, and to kill me. Sidney Carlow, son of the governor of the Mississippi Delta Confederacy. He had no title, but still he had an ancient profile, a face you could have imagined on the sphinx, though his ears stuck out. His hands were big. And our two nations . . . I locked my eyes onto the map at the front of the room. I could feel my classmates try not to look at Sidney and me. I could feel them try not to pity. None of us has ever wanted pity. The silence grew tighter and tighter. It was possible to imagine the sound of hoofbeats. We did not actually know what the Swan Riders did to us. When wars were declared, the hostage children of the warring parties went with the Rider to the grey room. They did not come back. A bullet to the brain was a reasonable and popular guess. Shoot his kids . . . The idea hung there, shuddering in the air, like the after-ring of a great bell. A laugh tore out of Sidney—and from outside the window came a flash. The Rider was upon us. The sun struck off the mirrored parts of her wings. Sidney grabbed my hand. I felt a surge of hot and cold, as if Sidney were electric, as if he had wired himself straight into my nerves. It surely could not be that he had never touched me before. We had been sitting side by side for years. I knew the hollow at the nape of his neck; I knew the habitual curl of his hands. But it felt like a first touch. I could feel my heartbeat pounding in the tips of my fingers. The Rider came out of the apple orchard and into the vegetable gardens. She swung down from her horse and led it toward us, picking her way, careful of the lettuce. I counted breaths to calm myself. My fingers wove through Sidney’s, and his through mine, and we held on tight. At the goat pen the Swan Rider looped the reins around the horse’s neck and pumped some water into the trough. The horse dipped its head and slopped at it. The Rider gave the horse a little pat, and for a moment paused, her head bowed. The sunlight rippled from the aluminum and the glossy feathers of her wings, as if she were shaking. Then she straightened, turned, and walked toward the main doors of the hall, out of our view. Our room hung in silence. Filled with a certain unfortunate image. I took a deep breath and lifted my chin. I could do this. The Swan Rider would call my name, and I would go with her. I would walk out well. Sidney was crushing my knuckles. My hand throbbed, but I did not pull away. “What?” said Sidney. His hand ripped out of mine. My heart leapt. I felt dizzy, blind, sick with joy. I was not going to die; only Sidney was. I was not going to die. Only Sidney. “If I were not sure, Mr. Carlow, I would not bring you such news,” said the Abbot. He eased himself aside. Behind him stood the Swan Rider. “But my father,” said Sidney. It would have been his father who’d made the decision to declare war—and made it knowing that it would send a Swan Rider here. Would he have to be dragged? We all lived in horror of it, that we would start screaming, that we would have to be dragged. The Swan Rider lifted her eyebrows, startling eyebrows like heavy black slashes. Sidney was frozen. It was almost too late. The Swan Rider began to move—and then, hardly knowing what I did, I stepped forward. I touched Sidney’s wrist, where the skin was soft and folded. He jerked and his head snapped round. I could see the whites all around his eyes. “I’ll go with you,” I said. Not to die, because it was not my turn. Not to save him, because I couldn’t. He took one step forward. His hand slipped free of mine and struck his leg with a sound like a slab of meat hitting a counter. But he managed another step, and then another. The Swan Rider took his elbow, as if they were in a formal procession. They went out the door. It closed behind them. Nothing and nothing and nothing. The silence was not an absence of sound, but an active thing. I could feel it turning and burrowing inside my ears. The seven of us—or rather, the six of us—stood close together and stared at the door. There was something wrong with the way we did it, but I did not know if we should stand closer together or farther apart. We were trained to walk out, but we got no training for this. At the front of the room, Brother Delta clicked. “Our topic was World War One, I believe,” he began. High overhead, a bell tolled three times. “No need,” said Da-Xia. She’d told me once about the Blue Tara, fiercest and most beloved goddess of her mountain country, known for destroying her enemies and spreading joy. I had never quite shaken the image. There were ten generations of royalty in Xie’s voice—but more than that, there were icy mountains, and a million people who thought she was a god. The others went out, huddling close together. I wanted to go with them—I felt the same desire for closeness, for a herd—but found myself staggering as I tried to walk. My knees were both stiff and shot with tremors, as if I had been carrying something heavy, and had only now set it down. And so very nearly, me. Xie’s hand slipped into mine. “Greta,” she said. Xie and I have been roommates since I was five. How many times have I heard her say my name? In that moment she lifted it up for me and held it like a mirror. I saw myself, and I remembered myself. A hostage, yes. But a princess, a duchess. The daughter of a queen. So I made myself move. Da-Xia and I went slowly: two princesses, arm in arm. We walked out together, from the darkness into the summer sun. Greta is a crown princess—and a hostage to peace, held by the de facto ruler of the world, the great Artificial Intelligence, Talis. Greta and the other royal hostages are Talis’s strategy to keep the peace: if her country enters a war, Greta dies. Greta will be free if she can make it to her eighteenth birthday. Until then she is prepared to die with dignity, if necessary. But everything changes when a new hostage arrives, a boy who refuses to play by the rules and opens Greta’s eyes to the brutality of the system and to her own power. 1. War has been with us throughout human history, but there has also been a corresponding desire for peace. Do you think world peace will ever be attained? Can you suggest how that might happen? 2. Define and discuss the term “artificial intelligence.” Could computers, smartphones, and robots ever be truly “intelligent”? If not, why not? If so, what are the benefits they provide, and the dangers they pose to humans? Do you think it will ever become possible for humans to “upload” their consciousness into machines? Would that be a good idea? 1. What genre would you consider The Scorpion Rules to be? Is it strictly a science fiction story, or is it also a dystopian novel? How are the two genres alike and different? 2. The Utterances are the collected quotations of Talis. Do you feel they are a political work or more like a holy text? Why are the Children of Peace expected to know them by heart? What purpose do they serve as a writing device? 3. Discuss Greta’s stoicism. How has her study of classical philosophy contributed to this aspect of her personality? How does her upbringing as a Child of Peace influence it? 4. At one point when Elián first arrives, Greta thinks: “He looked like someone who’d been told he was going to die.” What do you think that looks like? How would you feel if you’d been given that news? 5. Discuss the “morality of altitude”—the ability of pilots and drone operators to kill people without looking any of them in the eye. Is this type of war more or less savage than a bloody, close-up conflict? 6. The Children of Peace have been trained to behave in a dignified manner, even when they are facing death. Do you think this training is cruel? 7. In the title, do you think the word “rules” is a noun or a verb? Could it be both? 8. The political conflict in The Scorpion Rules is about access to fresh water. Discuss whether this seems plausible. 9. Is Talis a multidimensional character? What do you know about him before his physical appearance in the story? How does the author present him as male even though he inhabits a female body? What more do you learn about him in the latter part of the novel? Talis was once human—does he display any humanity? Does he display any “monster” qualities? 10. Greta finds herself falling in love with Xie while she is also drawn to Elián. Does that feel natural to you that she could care for both of them? Does it seem to matter in their society? 11. Discuss the following quote from Chapter 11: “You cannot control a man if you take everything from him. You must leave him something to lose.” Do you agree? Is there a certain freedom that comes from being unencumbered? 12. The Abbot is a Class Two Artificial Intelligence with full rights of personhood. Do you think this is right? Can an AI who was once human still be a “person?” In what ways does the Abbot demonstrate human qualities? 13. In Chapter 8, shortly after Elián’s arrival, Greta says, “I had changed.” Describe Greta before this statement. How has her relationship with the Abbot and her mother shaped her character? How has she changed? How has knowing Elián helped cause these changes? 14. Xie and Elián tell Greta that they think about escaping all the time, but Greta has never thought about it. Is it because she thinks being a Child of Peace is her destiny, or is she just resigned to her fate? Imagine that you are a prisoner—would you feel like Greta or the others? 15. Greta says that something she’s learned is that “the weaknesses we perceive in others are often the ones we fear in ourselves.” Do you agree? Can you think of personal examples? Historical examples? 16. Early on, it’s clear that the Abbot and the other children see Greta as a leader even though she doesn’t realize it. As the story progresses, she begins to discover and claim her power—give examples of incidents or insights that demonstrate this to readers. Is Greta pleased about it? Are you worried that once she has joined Talis she will misuse her power? 17. “In the midst of life we are in death.” Greta believes this to be a reversible statement: In the midst of death we are in life. Do you agree? If you were facing death, would you be able to fully embrace living? Could you have a meaningful life if you were immortal? 18. Almost as soon as Cumberlanders invade the Precepture, Tolliver Burr begins planning Greta’s torture with the apple press. Why do you think that torture is one of the rituals of war? Do you think torture always gets “results”? Why does it still exist when laws have been passed against it? Are all torturers evil people, or do societies at war create systems that make ordinary people into torturers? 19. Greta describes the proctors: “They might technically have been intelligent, but they weren’t sentient.” What do you consider to be the difference between the two? 20. Greta describes Elián’s stupidity in challenging the status quo: “Like any force of nature, it sought new channels.” Do you agree with her that he is being stupid, or is he being heroic, like Spartacus? 21. At the beginning of Chapter 20, after the Abbot tells Greta there might be an alternative to dying, she thinks: “Stirring inside me was the kind of fear that comes with hope.” What does Greta mean? Do you think that hope can inspire fear? Can you give an example? 1. Greta’s world is highly technological and has been “saved” by machines, and yet she and her fellow hostages live in a mostly pastoral, primitive setting. Write an essay comparing the positives/negatives of both settings. The beginning of Chapter 6 discusses the technological choices of Greta’s society. Is our society headed for the same future? 2. Research and write a report on the history of artificial intelligence in our world, or a report on the depiction of artificial intelligence in our popular culture—books, movies, and television. 3. Write a short story that imagines a future meeting between Greta and Xie, or Greta and Elián, after she returns from the Red Mountains. 4. Read another science fiction or dystopian novel, such as Divergent or The Hunger Games. How does it compare to The Scorpion Rules? How are the worlds alike or different: government, computers, and citizens? How does Greta compare to the protagonist in the novel? Discuss your thoughts with a partner in class, who should also share his/her thoughts about a science fiction novel that he/she has read. 5. Research and write a report on the life and works of Marcus Aurelius, one of the pillars of Greta’s classical education. 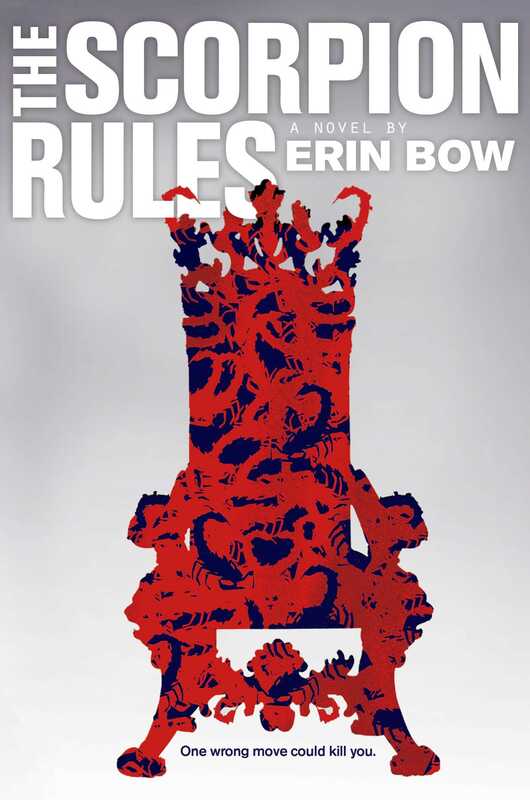 Erin Bow is the author of The Scorpion Rules, which received three starred reviews and was a Kirkus Reviews Best Book of the Year and it’s sequel, The Swan Riders, which received two starred reviews. She also wrote the acclaimed Russian-flavored fantasy Plain Kate, which received two starred reviews and was a YALSA Best Book of the Year, and the terrifying YA ghost story Sorrow’s Knot, which received five starred reviews and was a Kirkus Reviews Best Book of the Year. Visit her at ErinBow.com. *"Slyly humorous, starkly thought-provoking, passionate, and compassionate—and impeccably written to boot: not to be missed." *"Bow continually yanks the rug out from under readers, defying expectations as she crafts a masterly story with a diverse cast, shocking twists, and gut-punching emotional moments." *"Masterful, electric prose... Bow delivers a knockout dystopian novel that readers will devour with their hearts in their mouths." "Bow has crafted a true sci-fi narrative around the AI premise, utilizing an imaginative world and well-developed characters. Through Greta’s conflicts, the author explores what it means to be human." " This is a smart, compelling read that explores the complicated nature of love, family, peace, war, and technology; fans of Johnson’s Summer Prince and Collins’s Hunger Games who are searching for an empowering and intelligent read-alike need look no further." "This is fearfully superlative storytelling- electrical tension crackles in every elegant word. The finest fiction I'veread this year." "Elegant world-building, white-knuckle plot, and wonderful characters make The Scorpion Rules an extraordinary tale. I couldn't put it down." "Bow's vision ofour apocalypse is stark, beautiful and terrifying. This is my favouritebook." "I don't know which is more delicious, the storytelling or the villain."